It was a pleasant summer’s evening when the party of four arrived back in Rossroe harbour after their trip to Louisburg. The two women had gone down to visit Killageever Holy Well while the men were lobster fishing nearby. After they came ashore the women went to the house to make tea while the men carried on down to a sheltered inlet with their lobsters. They had storage pots in the inlet where they would leave the lobsters safe overnight. It was while they were attending to their work that they discovered all the herring. The biggest shoal they had ever seen had travelled all the way in to their little cove. They knew their luck was in and that they had stumbled on something very big. Festy Mortimer painting currachs Photo courtesy of Giles Norman Photograhpy Galleries. Later that evening they bade farewell to the two women without telling them anything about their discovery. They were fearful that if they did, the women would spread the news and then all the local fishermen would be looking to share in the unexpected harvest. They told their own crowd only and joined up their biggest nets with those of two other men to ensure a bigger haul. The word got around eventually, but not before the four men had enclosed the mouth of the inlet with their combination of big nets. It took them a full month to haul out all the herring, using four currachs and two yawls every day. Each currach could hold three thousand herring and the much bigger yawls had the capacity to carry eight thousand herring. 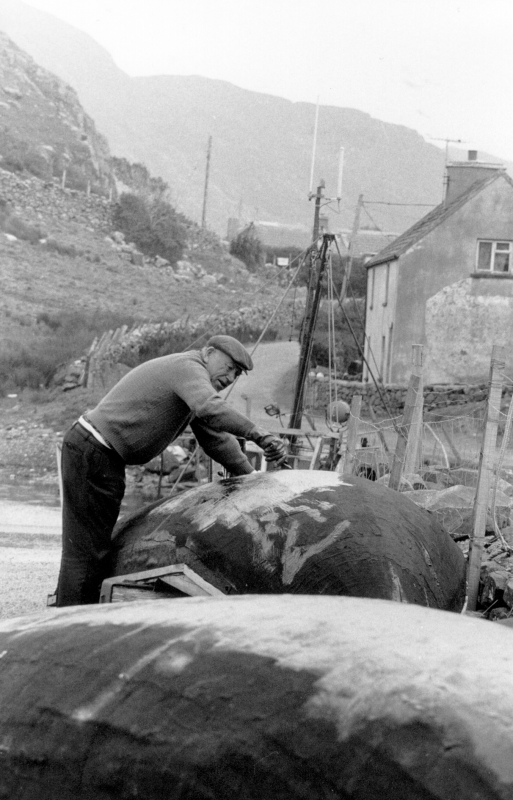 Harry McKeown, proprietor of the Leenane Hotel who was also a fish buyer and exporter bought all the herring off the men for export. This all happened in 1910, two years before I was born and the four men who enjoyed such good fortune that summer were Philip Coyne, my uncle George Mortimer, my father Michael Mortimer and my grandfather George Mortimer. My father told me years later that they made more money in that month than in all the years they had spent fishing before then.